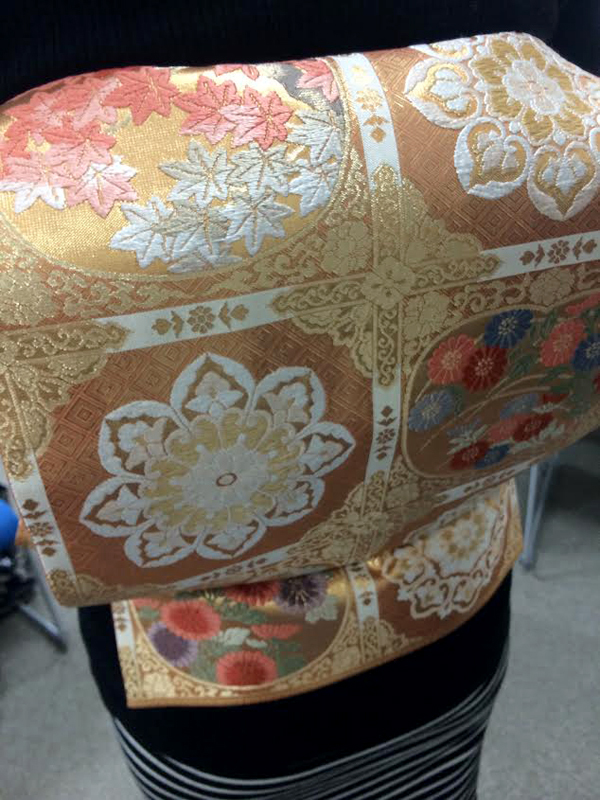 I attended “How to make a tied obi (kimono belt)” seminar the other day. A tied obi is the one to be made obi tying part such as puffed-out-bow(drum bow) or bowknot, etc., from the beginning to provide a simply attachable by oneself. There are some methods of making a tied obi, but once you make a tied obi with this method, you can use it constantly with a fixed size and shape without damaging an obi because it’s sewn. First, calculated length and size of obi by measuring my body height and waist. Then, decide the center of a tied obi by considering patterns and tyed it up. 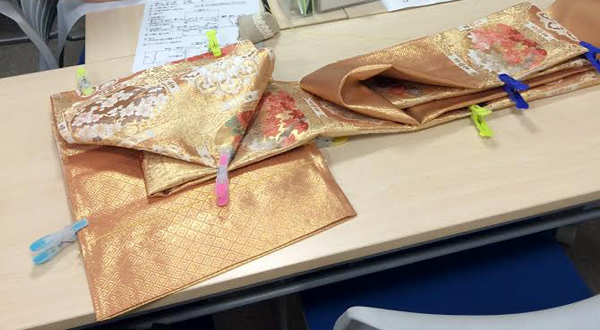 I had hard time to sew obi since my obi is weaven wtih gold thread, but 2hours later, I could make it! At last, I was learnt how to put it on. I’m an absolute biggine, but I could easily and beautifully attache obi by myself. Patterna and colors of obi have a different tast from what we wear, western clothes, now in Japan. Each obi are unigue and gorgeous tastes. In that seminar, I often heard that it’s hard to put on kimono and obi by oneself or remember how to put on since they occationally wear it. Nowadays only a small handful people wear kimono on a daily basis even in Japan. I’m also the one that kept kimono into the closet for years with bastign thred on. Someone who wears kimono daily in a traditional way might frown on this method, but I wonder this method will be a big help to expand people who wear kimono. I’d like to go out with my kimono on classy and elegant.